Here we meet "Henke" the day before traveling to Manhattan for his 14th NHL season in one of Frölundaborg's guest dressing rooms, this is where we sit and talk untouched until Loui Eriksson, Andreas Johnsson & Co comes in after today's practice. 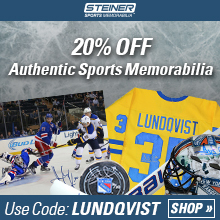 Henrik Lundqvist has only run physics. Tomorrow Friday, he flies back to New York. Exciting season awaits, but also an exciting year for Elder daughter Charlise, 6. She starts first grade this fall. ** A little adventure, well? - She speaks most English. We may try to work in Swedish. - So old I'm not! ... Henke says quickly, but does a good laugh and a laugh. Equally outdated, something is in the mind, for New York Rangers - as last season pulled away X number of veterans to make a reboot - this season will have a less credited team than before, one where several young players need to take big steps. Lias Andersson (born -98) is one. Czech Filip Chytil (-99) another. "Clearly, I feel responsible, I've been to Rangers for 13 years now, so I've known the past few years, but - maybe even more now, thought Henrik. ## Say goodbye to some stars, sell off, "Cash in" (in the form of players and draft choices, not money). ## Ask the young people in the organization. ## Drawing smart and building for the future. Then the New York Rangers acted during and after last season. Hopefully the future will be fine. Just a chin for Henrik Lundqvist. He turned 36 in March. Up there. In NHL's top layer. With the chance to win the Stanley Cup. Rangers fell in the final against Los Angeles Kings 2014, the question is well unless it was the last chance for the guy called the King of New York. ** Or is it realistic to believe in a quick return to the top of Rangers? How do you look at it, Henrik? "I think ... you may have to take it year by year, do not think about how long it can take without ... now this year applies. There is nothing saying that it can not be reversed quickly, but this year will be important, since next year there is also room for development. The American NBC recently wrote that Henrik Lundqvist needed a miracle in order for Rangers to go to the final play this winter, already year 1 of the conversion phase. "After the camp we know more where we stand, but as a team we must overpower to go to the playoffs. In order for us as a team to take the next step, the young players must take several steps. Important that they come in with a desire to move forward, forward. Take place. 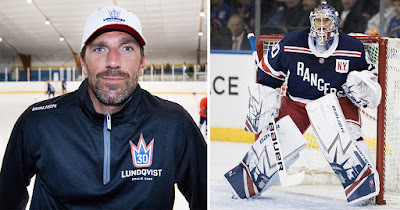 Henrik Lundqvist knows that his Rangers goes into the season as anything but a tipped top team, knowing that the dream of a Stanley Cup triumph feels more distant than before, he is - as seem-rave and honest with what it takes to over basically go to the playoffs. - It will be exciting this. The idea is that we will start over. You can see how some other teams look like ... at the same time we can not be okay that "It was not meant to be", we have to put the rib as high as we can, but still have a realistic goal. Henrik talks about a camp that becomes important, he does not want to look too far forward, the contract expires in 2021, but as he says - he does not know how many years he has left. The ex-freestyle round goes over to live a lot in the present, focusing on their own game. You can always do that, but it feels something more important now. "I feel it's no idea to look too far ahead, do not think too much. Every year, their feelings are in some way, their expectations, their prerequisites, but ... now, I actually do not know where we are. We will see under camp, who will play where, how shall we play? And what young ones are taking up. And how fast it is possible to build new ones. "You'll see it more shortly when we are in this situation, the construction phase, the conversion phase, you have to go to yourself, do as good as you can, and see where we stand for months in the season. Henrik Lundqvist has hunted the Stanley Cup since joining NHL in autumn 2005, suddenly he is in a new situation. Daddy, okay, not it then, but more than usual a leader in a converted team, almost no one believes in. All success is a bonus. - They (fans) know where we are, everyone wants success, but they have an understanding, we do not have the same expectations for us this year. Consider David Quinn, an American who has been responsible for Boston University for the last five years, is a new coach and Henrik Lundqvist may still have a right stimulating season in front of him where the demands are lower and success can be measured not only in results but also in development. David Quinn was in Gothenburg in July to meet his goalkeeper star. - Good initiative, you get a feel for each other before the season starts. Very positive. Quinn is rookie as NHL head coach (has assisted in Colorado Avalanche), but there was a point when Rangers GM Jeff Gorton chose to replace kicked Alain Vigneault with 52-year-old Quinn. "The important thing is that you can hockey. And in the state we are now, with many young players who require some guidance, it's very good with a coach who is used to working with young people. 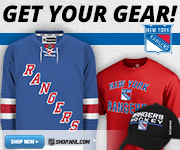 There is a thought with all New York Rangers doing. The question is how it goes.